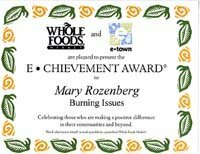 Welcome to BurningIssues.org, home page for Clean Air Revival, Inc. Burning solid fuel yields particulate pollution - solid particles smaller than a red blood cell which have been implicated in 30,000 deaths in the US and 2.1 million deaths world wide per year. . "Particulate pollution is the most important contaminant in our air. ...we know that when particle levels go up, people die1. " Indeed, wood smoke is chemically active in the body 40 times longer than tobacco2. 3. Strategies for Reducing Residential Wood Smoke. EPA Document # EPA-456/B-09-001, September 2009. Prepared by Outreach and Information Division, Air Quality Planning Division, Office of Air Quality Planning and Standards, U.S. Environmental Protection Agency, Research Triangle Park, NC 27711. pp. 4-5. All combustion results in very fine micro particulates and there is no safe level of this asbestos sized, dangerous air pollutant. Solid fuels, such as pellets and especially wood, produce many orders of magnitude more smoke & fine particulate air pollutants than cleaner fuels. Clean Air Revival provides public education about the medical hazards of exposure to wood smoke and other fine particulate pollution. Smoke from residential burning of wood and coal, wood burning restaurants and outdoor burning of wood, leaves, crops, tires and debris is permeating our neighborhoods, resulting in high ground level concentrations of toxic air pollution. Visit our Action Page for suggestions for what you can do. Visit our Video page to see some wood burning videos. See our Fair Use page.